If you’re looking for ketogenic supplements you might be considering BeLive Store Keto Zone. In this review, we’ll be assessing some of the most important features of this product to determine if it is a worthwhile purchase. BeLive Store Keto Zone is designed to help people achieve a state of ketosis and to maintain it. The three ingredients listed in this product are known as ketone salts. This is because once they are in the blood, they are separated into their minerals and beta hydroxybutyrate. Beta hydroxybutyrate is the most common ketone that the body produces when it is in ketosis. By taking more of it from outside sources, like this supplement, the body is pushed into ketosis very quickly. A recent scientific study found that the beta hydroxybutyrate is used by the muscles and the brain for energy, while the minerals – calcium, magnesium and sodium can help the muscles to contract and relax. The presence of ketones in muscle cells cause the cells to rely more strongly on non-carbohydrate chemical reactions to produce energy. This causes the increased breakdown of fats in the muscle tissue, and the reduction in the formation of lactic acid which often is the cause of muscle stiffness. When used over a long term, the state of ketosis can contribute to consistent weight loss. One scoop of the supplement (which is in a powder form) must be mixed with 12 oz of water and the mixture can be taken with or without a meal. It is not recommended for users to exceed this dose. There have been no side effects reported with the use of beta hydroxybutyrate salts. It is advised that pregnant and nursing mothers as well as anyone who is taking medication for a chronic condition to seek the guidance of a healthcare professional before using this supplement though. 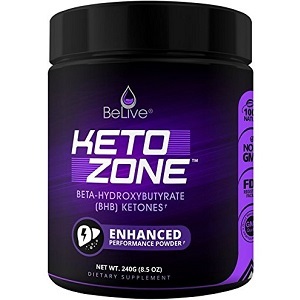 A container which has 8.5 oz of BeLive Store Keto Zone can be purchased online for $39.99. We were unable to determine whether this price includes shipping. The manufacturer has a loyalty program for customers to sign up and receive coupons and special promotions. The manufacturer claims to have a complete money back guarantee, but despite our best efforts, we could not find any elaboration on this, so we cannot say how long it is for nor what conditions the product must be returned in. This supplement contains the right ketone salts to put the body into ketosis. These salts are definitely well researched. The price of this supplement is also relatively low. The purchase of BeLive Store Keto Zone still a bit of a risky purchase though, because the manufacturer is not clear and transparent about their guarantee. This may leave customers frustrated and having wasted their money. We have observed more transparent manufacturers out there that offer a supplement of equal or better quality, so potential customers should consider looking at these as well. John Parker	reviewed BeLive Store Keto Zone	on October 15th	 and gave it a rating of 2.5.